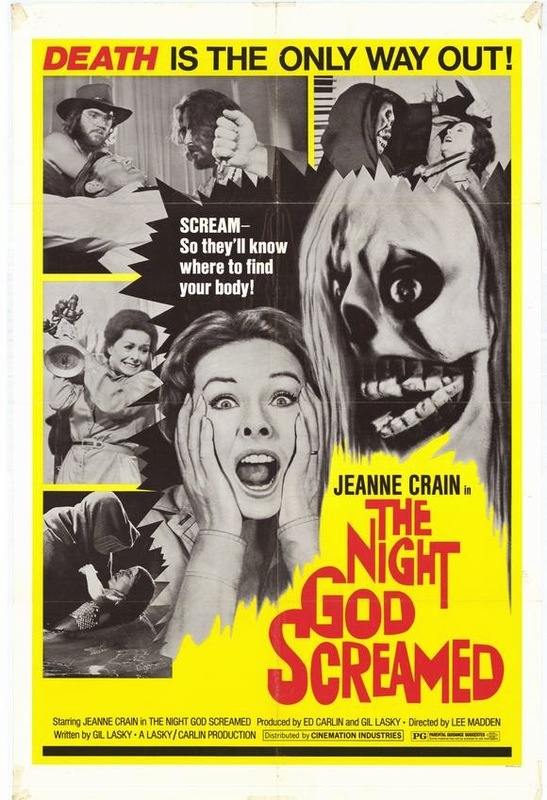 The Night God Screamed Directed by Lee Madden, Starring Jeanne Crain (1971). 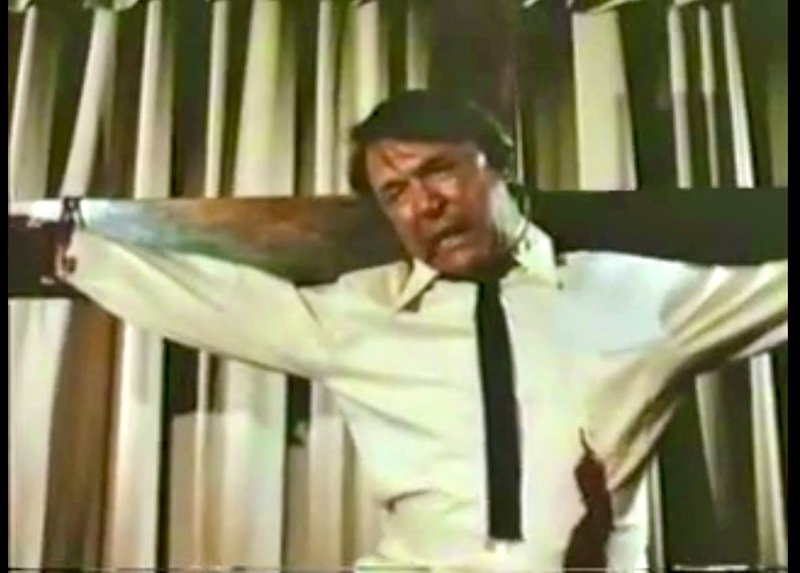 There's a shocking amount of Manson-sploitations out there that were clamoring for the all mighty dollar in the early 70's, most of them are inferior to my favorite Satanic hippie flick I Drink your Blood! 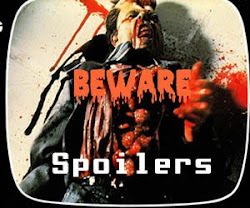 The Jerry Gross company Cinemation Industries actually put this tepid, awful excuse for a "horror movie" out. I kept hoping that cool skeleton mask would show up, but it never did! 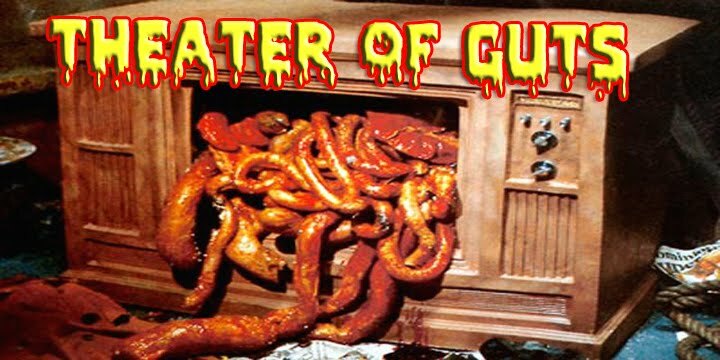 The VHS quality on this Youtube presentation is all shades of squiggly pink and brown the only place to get a better copy is thru Just For The Hell Of It (JFHI.COM). A creepy crawly bunch of Manson-esque slippies congregate around a swimming hole, as a tripped out Steve Railsback impersonator uses a hooded figure to drown a girl he believes is a narc. I find it strange that Helter Skelter didn't come out until a few years later, maybe Steve copied this guy? Wait that can't be right because they're both copying the ultimate hammy loser and former Beach Boy! The credit sequence font in this film reminds me of A Hard Days Night! I call the sawed off shotgun on my lap "HIPPIE SKULL VENTILATOR"
A woman named Fanny Coogan (Jeanne Crain) who works at a homeless shelter is fed up with everything- God, being broke and just ripe for some messianic wacko to jump in and brainwash her! Her ridged preacher husband scoffs at her depression and chalks it all up to God's will. 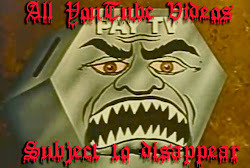 What this movie needs is "Billy Jack" or "Bibleman" to step in and crack some skulls! The hippies hassle the religious couple at a truck stop and aim to steal a pretty sweet cross they lug around in the back of a pickup truck. The rag tag cult shows up late at night while Fanny's husband is alone and they actually nail him to his own giant cross! It's all done in grainy darkness in a PG way so you don't get the ghoulish benefit. I like how the Christ-like leader says "God's on our side, not yours" in a high whiny fashion! I mean in this scenario if some punks snuck into an ex-evangelical president's church and did the same thing would anyone feel that bad? I guess the husband dies, because we never see him again. Oh Fiddlesticks, now I got heartburn too! Fanny is so receptive to mind control and has a guilty conscience that she feels bad for Billy Joe Harlan! That's right folks, the scary cult leader played by Michael Sugich is named Billy Joe! This was Sugich's last known performance in acting, I wonder what he's up to now, maybe he works at Trader Joes? The scary hippies take a break for awhile and return later only through prank calls. Sometimes this film resembles a really dull episode of Night Gallery. Besides the crucifixion, there's little to no violence. 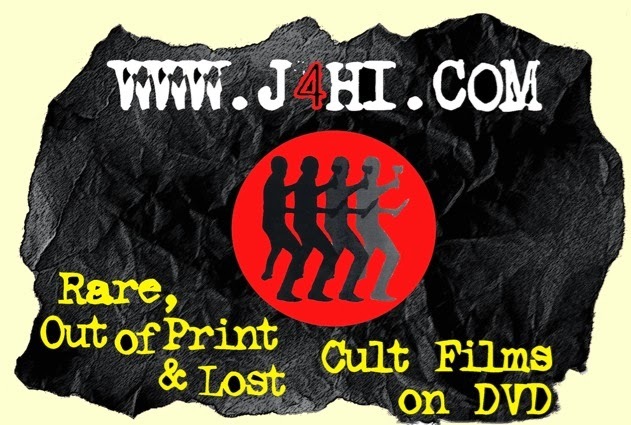 There's a good reason, this film isn't mentioned that often and J4HI.COM carries the only available DVD, besides them you can only find it on poor quality VHS tapes. This one is still a rarity while Death Bed is available on Blu-ray? It's a sick world I tells ya! They should have called this "The Night the Audience Snored"! There's a twist ending that's not worth sticking around for. 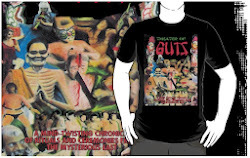 This is among one of the earliest films inspired by the infamous Spahn Ranch lunatics along with The Love Thrill Murders (Sweet Savior), The Manson Massacre and The Deathmaster. Some of these are blatant portrayals of the infamous hippie cult, while others are a coincidental jesus freak or vampire sect. Then there's Lawrence Merrick's documentary with the real Family in 1973, this concludes our Manson trivia portion of the review! 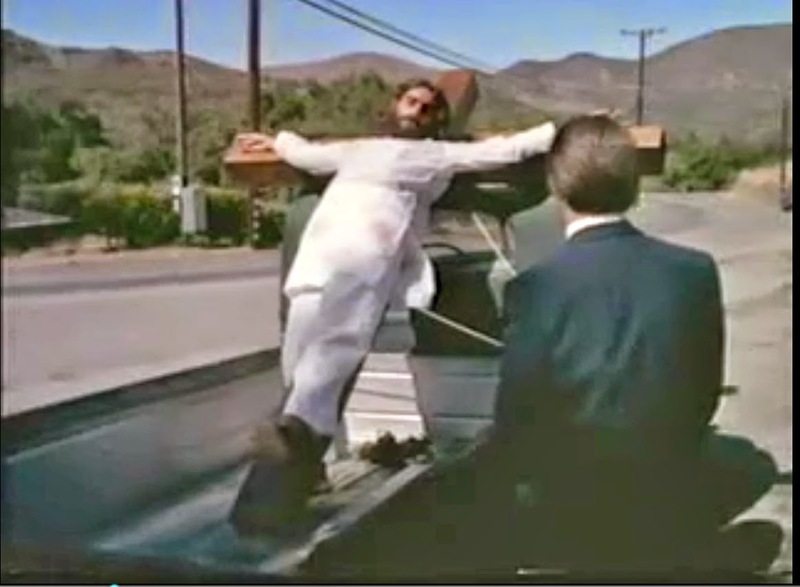 Martin Landau oddly enough would do a scarier job with the fake Manson's catch phrase,"Vengeance is mine sayeth the lord! ", later on in Alone in the Dark. 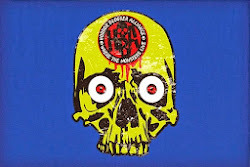 If you really need to see this worm ridden filth, J4HI.COM has got you covered, don't ruin your eyeballs like I did.